Recently, US presidential candidate Donald Trump referred to his bragging about being entitled to groping women without their consent as “Locker room talk”. This sparked a series of reactions and that of many men’s sports teams was to respond: #NotInOurLockerRoom. We join our voice to theirs and say that our league does not welcome and would never condone acts of aggression and misogynistic attitudes such as his. We are a proud safe co-ed league and Trump’s statements will find no echo in our locker rooms. 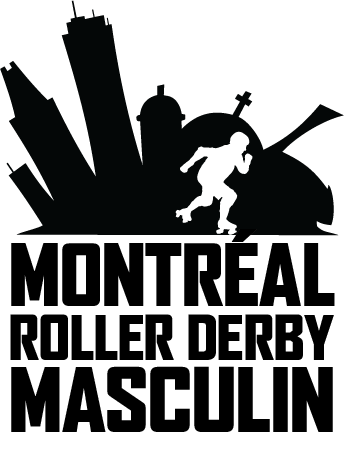 Congratulations to Mont-Royals’ Tank, El Tannant, The Rev et Buddy Oli who will represent Canada at the 2016 Men’s Roller Derby World Cup this summer! Want to support MRDWC? T-shirts are available! This week-end, the Mont-Royals kick-off their season with two matches in Philly, against the Collision and the Hooligans! Click the link above to see the Mont-Royals in action against the Cincinnati Battering Rams! GO MONT-ROYALS GO!